Most games earn you 1 Reward Point for every 40€ wagered in Real Money mode. For full details, see our Bonus Policy page. Each VIP level has a unique Redemption Rate, detailing how many points you must accumulate before you can exchange them for bonus cash. Example: Bronze VIP, requires 30 points to redeem 1€, whereas Prestige VIP, requires only 15 points. You can check out your status by logging in, selecting “My Account” from the menu and clicking on “My Rewards”. fun4belgium reserves the right to modify the contents and any mechanism of the VIP Program at any time - with 2 weeks’ notice provided to players. fun4belgium reserves the right to cancel the VIP Program at any time - with two (2) weeks’ notice provided to players. fun4belgium reserves the right to suspend the earning and/or redemption of Reward Points at any time without prior notice to players. Any breach by players of general fun4belgium Terms and Conditions may result in the forfeiture of a VIP Level and/or any Reward Points accumulated and may result in account closure. fun4belgium will endeavour to maintain current Reward Point and Reward Level updates whenever possible; however, fun4belgium cannot be held responsible for any loss of Reward Points or update delays due to data transmission issues. 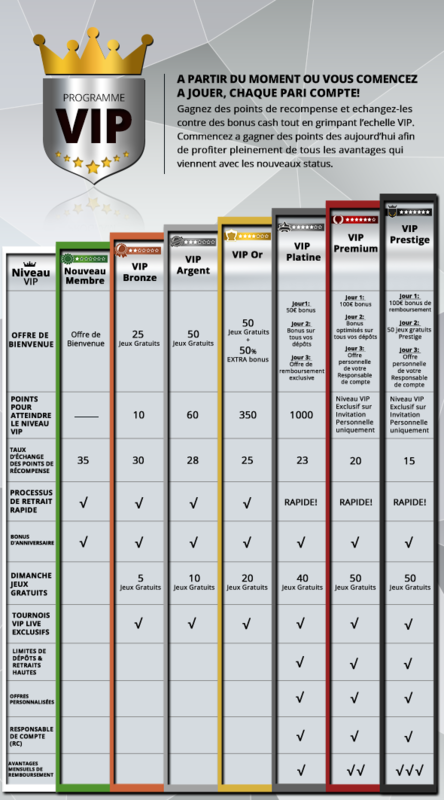 The fun4belgium general Terms and Conditions also apply to the VIP Program. fun4belgium’s decisions regarding the VIP Program will be final and not subject to appeal. If a player chooses to close their fun4belgium account (or has their account closed by fun4belgium), they will forfeit their VIP Level and lose all Reward Points associated with that account.